I demand that the next update for Kinja Features adds more spaceships to the O-Deck! More I say! Say hi to Centurion Tarok Vorenus, commander of the R.R.W Alopex. 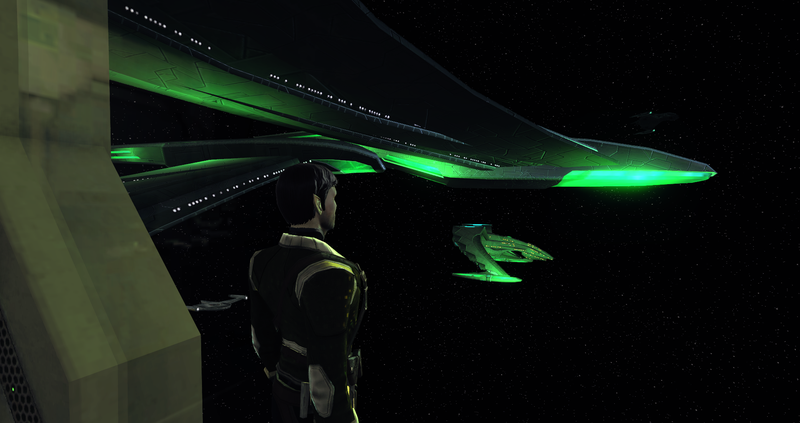 STO's Legacy of Romulus is pretty cool so far. I'm surprised at how high the quality of the presentation been - actual, consistent voice acting! - and I love the new, LCARS-y UI. The Romulans themselves are a pretty interesting faction too. The first 10 levels of the game are all about joining the Romulan Republic - a faction of Romulans who want to find a new Homeworld after Romulus' destruction during the events of Star Trek 2009 (this is set in the main Trek timeline, 22 years later from that event) free from control of the Tal Shiar, who are doing nasty things with borg tech and a mysterious race called the Elachi. I've only played as a Federation officer before, but I've really liked how story-leaning the opening to the Romulan content it is - although I dislike that the bridge officers you get are all 'story' included, as in with their own set names, genders, races, etc., but you can change their appearances. I like having a crew that feels like it's 'my own', that I've customised and tweaked. You can't see them in the picture though, which as bummer, as they all look kinda cool in their Republic uniforms! I'm interested in digging into more of the Romulan content, especially if it keeps up with the quality it's shown so far. LoR is free to all STO players regardless of their status (as is the base game, I think) - has anyone else come back to STO to try it out?